Nasturtium leaves are small to medium in size and are round and broad in shape, averaging 5-15 centimeters in diameter. The flat, bright green leaves are waxy, pliable, have a few veins running throughout, and are connected to a central stem. In addition to the leaves, Nasturtium plants are trailing vines and are known for their bright yellow, orange, and magenta blooms. Nasturtium leaves are tender with a slightly sweet, green, tangy, and peppery taste. The richer the soil the plants are grown in, the more pungent the leaves and stems will taste. Nasturtium leaves are available spring through early fall. Nasturtium leaves, botanically classified as Tropaeolum majus, grow on an herbaceous flowering plant and are members of the Tropaeolum family. The name “nasturtium” comes from the Latin words for nose (nas), and tortum (twist), which essentially translates to “twisted nose.” Many believe it was named for the reaction on a person’s face after biting into the peppery, bittersweet leaves. Nasturtiums are popular home garden plants, and the leaves can be used to add a peppery kick in many culinary dishes. In addition, a unique trait of Nasturtium leaves is that they are superhydrophobic, meaning the leaves contain waxy nanostructures that prevent water from absorbing through the top of the leaf. This process also cleans the leaf because as the water drops off, it removes dirt and debris allowing the leaf to have a clean surface to continue photosynthesis. Nasturtium leaves are an excellent source of vitamins A, C, and D, beta-carotene, iron, manganese, and flavonoids. 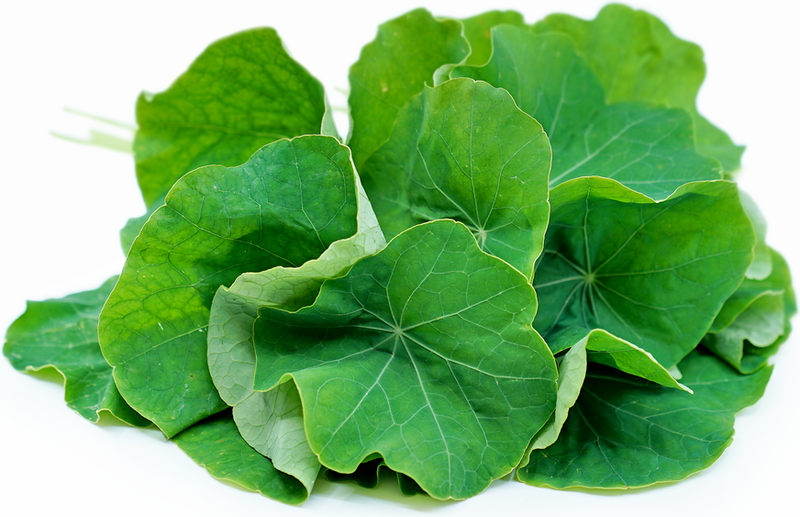 Nasturtium leaves are best suited for raw preparations and add a spicy or peppery flavor to dishes. They can be chopped and shredded into salads, used as the base for pesto, or chopped and combined with softened cheeses for spreads. The leaves can also be used as garnish atop savory muffins, mixed with chives in potato salads and omelets, and stuffed with rice and herbs for a take on Greek dolmas. Nasturtium leaves and blossoms can be added to a vinegar solution with a clove of garlic and left for four to five weeks to create a hot, pungent vinegar for salad dressings. They are also commonly boiled and used in tea. Nasturtium leaves pair well with aromatics such as garlic, chives, and onions, pine nuts, Dijon, dill, parsley, tarragon, capers, lemons, beets, microgreens, spinach, potatoes, and parmesan cheese. Nasturtium leaves will keep up to five days when stored fresh in a sealed plastic bag in the refrigerator. 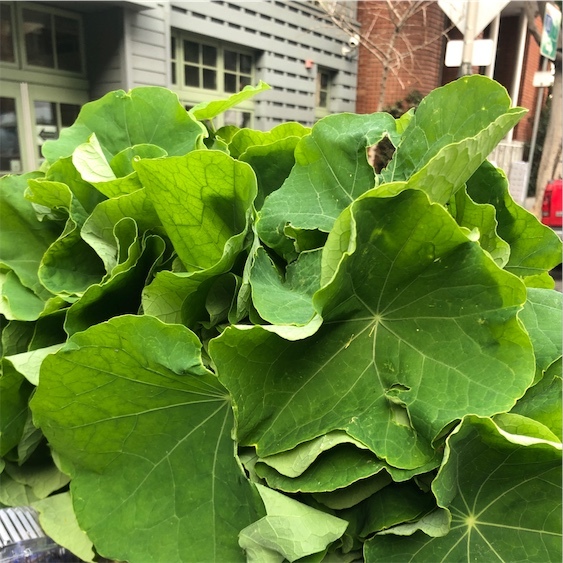 In South America, Nasturtium leaves have been used throughout the Andes as an herbal disinfectant, diuretic, and antiseptic to help reduce symptoms of chest congestion, wound care, and as a peppery pest repellant. The leaves were also believed to be used by the Incas as a medicinal herb and as an addition to salads. Nasturtium varieties today are descendent of two species native to Peru on the Western coast of South America. These species found their way to Europe via Spanish conquistadors. The long trailing vines that we are familiar with today were developed by a Danish botanist from the small plants brought to Europe. Nasturtiums were seen in the United States as early as 1759 and were planted in Thomas Jefferson’s Monticello garden. Nasturtium leaves can be found at specialty markets in Europe, regions of South America, and in the United States in California, Virginia, Pennsylvania, and Hawaii. Recipes that include Nasturtium Leaves. One is easiest, three is harder. 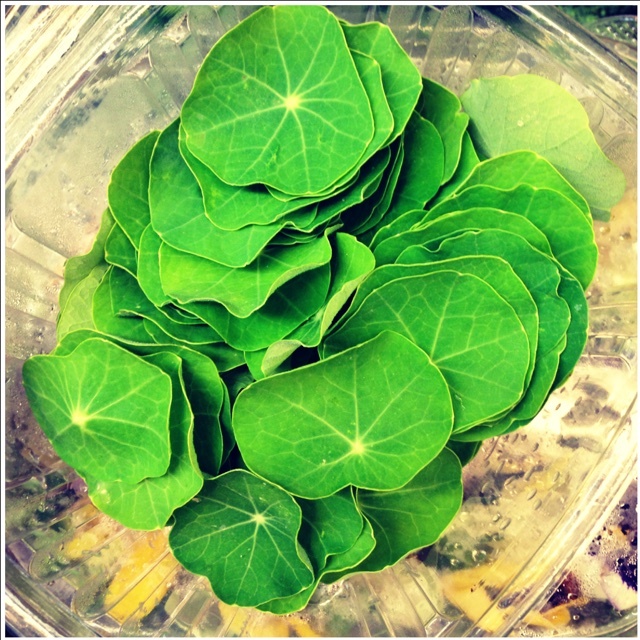 People have shared Nasturtium Leaves using the Specialty Produce app for iPhone and Android. Sharer's comments : Nasturtium Leaves spotted at Pike Place Market. A local delicate addition to any summer salad!